Patatas Bravas is a recipe I’ve fancied making for a while. It’s quite a traditional tapas recipe that originates from Spain and it’s a very simple fried potato and spiced tomato sauce dish. However, for all that it’s a basic recipe it really packs a hefty wallop in the flavour department thanks to its spicy, well-seasoned rich tomato sauce. Tapas are small portions of a wide range of foods which are served as appetisers or snacks in Spanish tapas bars, but can be ordered in quantity to make a buffet-style full meal. This recipe for patatas bravas makes two portions as a substantial main meal, but you could serve it as a side dish to accompany roast meat or fish and the quantities would serve four people. 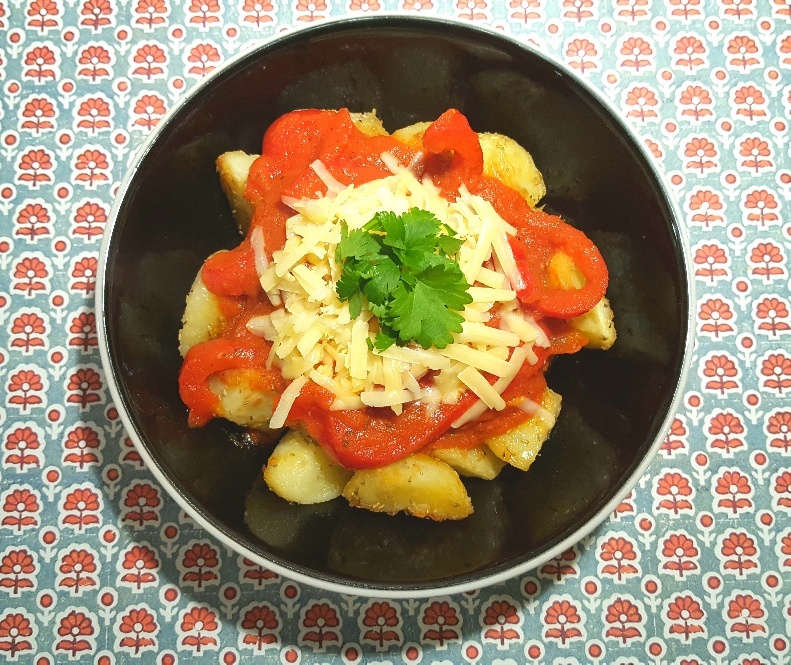 This patatas bravas is simply an excellent vegetable-based meal that’s filled with flavour. 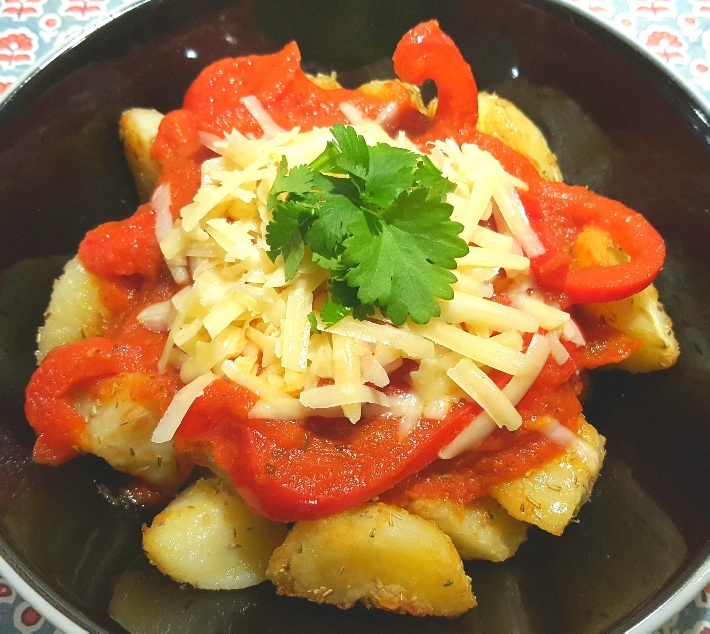 It makes a bowlful of crispy, sweet cubes of roasted potato which are drenched in a rich, spiced red pepper and tomato sauce and is topped with melting grated cheese and freshly chopped coriander. It’s a gorgeous bowlful of veg that celebrates traditional Spanish flavours. Boil your cubes of potato in heavily salted water and once they’re almost done, drain them and put them on a baking tray. Drizzle the potato with the oil, dried rosemary and salt and pepper and put the tray in the oven. In the meantime, make your tomato sauce by melting the butter in a large saucepan over a medium heat and adding the minced ginger, sugar and all of the spices. Add the diced red pepper, tin of chopped tomatoes and slices of tomato. Cook until the peppers are soft. Once your potatoes are roasted golden brown, divide them between two dishes and top with the tomato sauce. Serve with grated cheddar, parmesan and freshly chopped parsley or coriander.